The Best Above Ground Pool Cover Can ‘Cover’ Your Needs! An Above Ground Pool Cover Can ‘Cover’ Your Needs! When you invest in an above ground pool, it's good to do all you can to keep it well maintained and safe for your friends and family. You'll enjoy many sunny summer days and magical nights swimming in crystal clean water during the warm weather months. One thing that will serve several needs is being sure you purchase the best above ground pool cover to protect the water and your filter! Read below as we go through our top picks for pool coverings and discover the one that works best for you. When you buy the cover of your choice, you will know you're getting a good match for your backyard pool maintenance. When the days are warm and sunny, your pool water warms up also. But chilly nights can change that water to a frigid temperature! With this I﻿﻿﻿﻿﻿ntex Solar Pool Cover, the water in your pool will hold its temperature until you're ready to take a leisurely swim or have friends and family over for a backyard splash! Small pockets of air across the entire cover seal in the warmth and extend your swimming season! The Intex Solar Cover for their Easy Set and Frame Pools keeps your pool water cleaner and warmer! Extend your summer season of pool enjoyment by keeping it covered with this sturdy solar cover. Made from a lightweight but durable plastic, this cover 'floats' on the top and raps heat in, keeping dirt and debris out. Comes with a carrying bad for convenient and space-saving storage. Customers had problems with the small air bubbles breaking open. Intex created this 15-foot Easy Set pool to keep debris out of your pool and prevent water evaporation! There's a 12 inch overhang and a rope tie to tighten it around the blown up rim and keep it from being blown off by wind. This soft-walled pool cover has drain holes to stop water from accumulating and weighing down the cover. Intex uses strong 7 gauge vinyl to make this cover long lasting. Tightening the rope can cause a rip in the vinyl cover. Some customers were not happy with the prorated warranty. Please check with the manufacturer for warranty description. 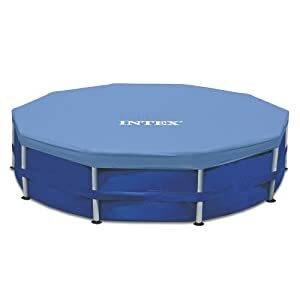 Intex Metal frame pools are matched with this 15-foot round cover. Keep your pool clean and free of bugs and dirt with this vinyl cover. Drain holes stop water from collecting into large puddles on the cover and this product comes with a rope tie to tighten it around the pool top. Keeping your pool clean and safe for your friends and family means more fun in the sun. And this cover will do the job! Leaves, leaves, leaves, pretty as they are in the fall they always seem to find their way into your pool in the summer! Blue Wave manufactures this Leaf Net to trap small leaves to large before they get into your pool. This leaf cover has a small mesh to catch the typical sized leaves and smaller pieces, keeping them from becoming a slimy mess. The Dirt Defender is made from woven polyethylene and has a 3 foot overlap. Use this to place over the top of your winter cover for easier spring pool setup or for use during the swimming season to keep up with leaves being blown into the water. When you set up your backyard family pool, choosing where to place it will affect the debris and leaves that make its way to into your water. With all the efforts you make to find the right spot, several factors will still cause dirt to get into the water and possibly large amounts of leaves that can clog your hoses. And that can damage your pool pump motor. A pool cover will provide protection from excess dirt and larger debris from getting into the water, but there are other uses for pool covers. Here are the 3 main pool covers and what they're used for. When your pool water warms up during the day, a solar cover maintains the temperature and keeps the water warm until you take the cover off to swim. These covers are typically made from polyethylene plastic and have tiny air bubbles over the entire surface. Sunshine creates warm air that is trapped in the bubbles, preventing the water underneath from cooling. These covers are kept on all night and typically during the day until you're ready to use the pool. Another added benefit is they will greatly reduce evaporation of water so you're not refilling the pool all the time. These lightweight covers are easy to put on and take off and also save your pool water from accumulating extra sand, dirt, and debris from when the wind picks up. Solar covers 'float' in the water and are fitted to match the actual width of your pool. 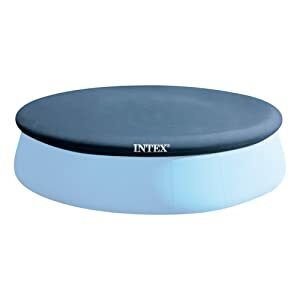 The Intex Solar Cover for 12ft Diameter Easy Set and Frame Pools is made by Intex for their soft-sided, blow up rimmed pools, but can be used on any round pool! Several sizes are available so you can pick the one right for your pool. Winter covers for pools are made for the times when your pool is not in use due to changing weather. If you live in an area with four seasons, you will want to prepare your above ground pool for the freezing temperatures. This applies to steel-walled and other permanent pools. A winter cover is used when shutting down the pool for long periods of time. Made with waterproof material, they are several feet wider than your pool's dimensions to accommodate for lower water levels. Above ground pools are winterized by letting out enough water to sit just below the skimmer and adding your winter chemicals. This solid cover is laid over the pool and made drape over the sides before being tightened with a strong cable and a winch. These solid covers keep your pool water protected from the elements and keep the water clean. 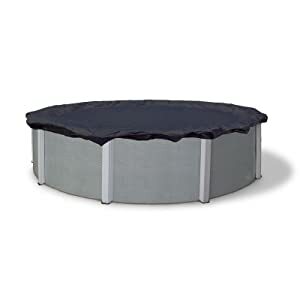 Winter covers with a black underside are preferred like the Blue Wave Bronze 8-Year 18-ft Round Above Ground Pool Winter Cover, to keep out as much light as possible. This prevents growth of algae while the pool is in storage mode. This is not the size mesh you would think. A mesh cover is meant for pools that need a cover for a non-permanent pool like an Intex soft-walled pool. They are made to protect the water when you need more debris caught than a leaf cover (below) can catch and want to use it for when no one is swimming to help it stay clean. 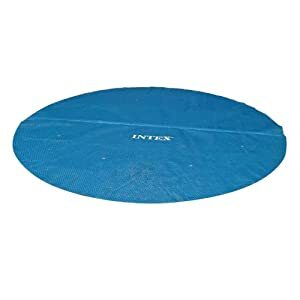 An example of this mesh cover is the Intex 15-Foot Round Easy Set Pool Cover. It has drain holes to prevent water from accumulating. A leaf cover is perfect for family pools that are in or near a thickly wooded area. When the amount of leaves blown into your pool water is hard to manage, a leaf cover is a great choice. It catches the larger leaves and prevents them from getting sucked into the skimmer and possibly clogging up the filter pump. We found the Blue Wave 24-ft Round Leaf Net Above Ground Pool Cover to be a good choice and it has quite a few sizes for round pools. Keeping your pool clean in for the sultry summer days and keeping it safe for the frosty winter weather is the goal of a cover for a pool. The benefits are worth the investment; cleaner water, warmer water, less leaves, less evaporation, and winter preparation. Now that you've read up on covers, we know you can buy the best above ground pool cover and end up with the perfect product for your pool needs!